We offer 30-day money-back guarantee for any reason and 1 year warranty. If you have question, please feel free to contact us or leave down your question at the page below. Super Bright: DOT, SAE legal light. With high grade Cree LED chip, much brighter and durable than other headlights. 4000lms on high beam and 2600lms on low beam for each headlight. 1600lms for each fog light. 6000K pure white light. The effective irradiation area is more larger than normal bulb. Really lights up the road for safer driving. Easy to Install: Come with instruction. Plug and Play. Very straightforward. The package comes with all the parts to make the headlights and fog lights work. Durable: Made of Polycarbonate lens which is more resistant than other headlights with fragile PMMA. With IP67 waterproof protection grade. They can work well in a variety of weather conditions. What You Get: 1 x Instruction. 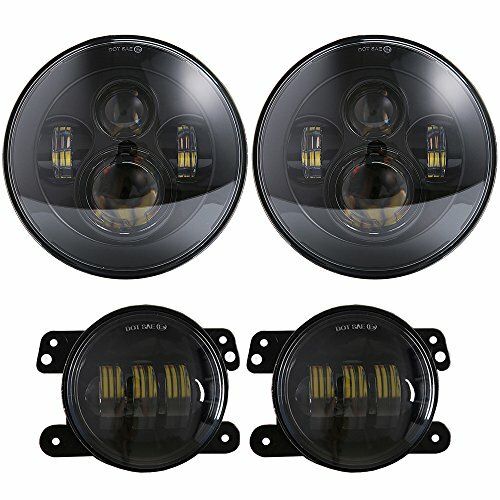 2 x 7 inches LED Headlights, 2 x 4 inches Fog Lights, 2 x H4-H13 Wire Harness for Headlights, 2 x 9005/9006-5202(H16) Wire Harness for Fog Lights. 30-day money-back guarantee for any reason and 1 year warranty.